Flowers are one of life's simple pleasures. At Terrain Flowers, we source fresh product from the best suppliers and then clean, hydrate and condition every stem to ensure maximum quality and vase life of your flower arrangement. 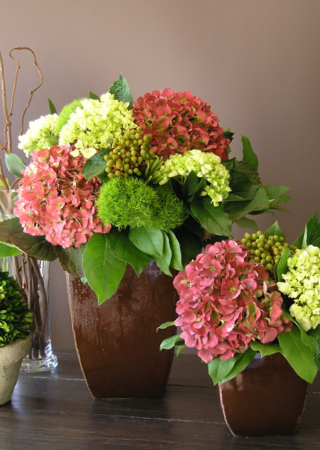 For any fresh cut flower, we recommend topping up the water in the vase or container every day. Slowly add water to within an inch of the top edge to ensure thorough hydration of each stem and help minimize bacteria growth. Our hand-tied bouquets are typically packaged in a cellophane bag of water or water tubes so there is no need to recut the stems; simply remove the cello bag and place the tied bouquet in a clean vase of water. For flowers in floral foam, top up the water in the vase, container or tray daily to half an inch from the top. Floral foam still needs daily top up as it dries out quickly! To display and enjoy your flowers, choose a cool spot that is out of direct sunlight and away from drafts or heating vents. Your flowers are typically set amongst lush premium foliage; as the flowers fade, the overall beauty and structure of the design remains. Carefully snip blooms as they fade. Do not pull the entire stem out of the arrangement as each design is made with a structural interlocking of the stems, thus keeping the floral elements securely in place. Pulling out stems may disrupt or break other stems and may leave gaps in the design. Some florists provide sachets of flower food. Studies show that the food is mixed disproportionately to the water, resulting in adverse effects on flower longevity. All our flowers are hydrated in our shop in carefully measured professional food and water solution. Once they arrive at your place, plain cold water is all your flowers need! Remember to protect delicate surfaces from moisture and excess water. Find out about eco-friendly flowers and creating a healthier, happier world. Visit the Sierra web site to find and learn about all kinds of flowers.